Sibling number four is my very beautiful sister Janai. In addition to the usual identity crises associated with TCKs Janai has had the added complication of having a foreign name. In Chinese her name (pronounced jen-ai or ren-ai) means “true love” but unfortunately, in Japanese ja-nai means “am not” or “is not”. Thus Janai spent many years of her life reluctantly being called by her second name, Clare. Guess what my darling husband jokingly said to her when they met in Taiwan? “Clare? That’s a fat girl’s name.” Thank you John Hughes and The Breakfast Club! However the shy girl grew up into a sassy lady who often renders men speechless when she extends a manicured hand and introduces herself, often repeating her exotic name several times for the bumbling gentlemen that can’t seem to get it right. Ah, I remember those chicken wings well. 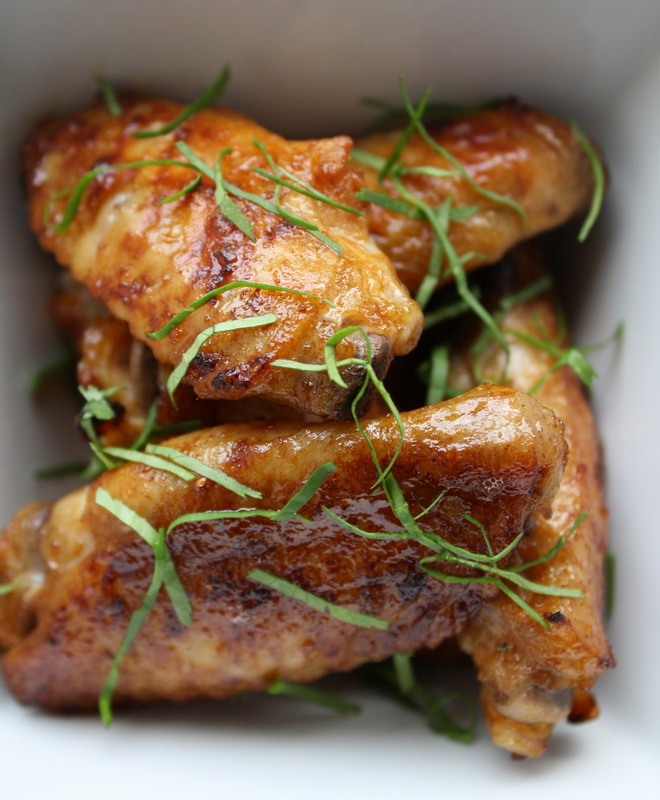 They were the frequent stars of our dinner table because wings were cheap and the sauce was composed of just about every spice in the cupboard, and every condiment in the refrigerator door. 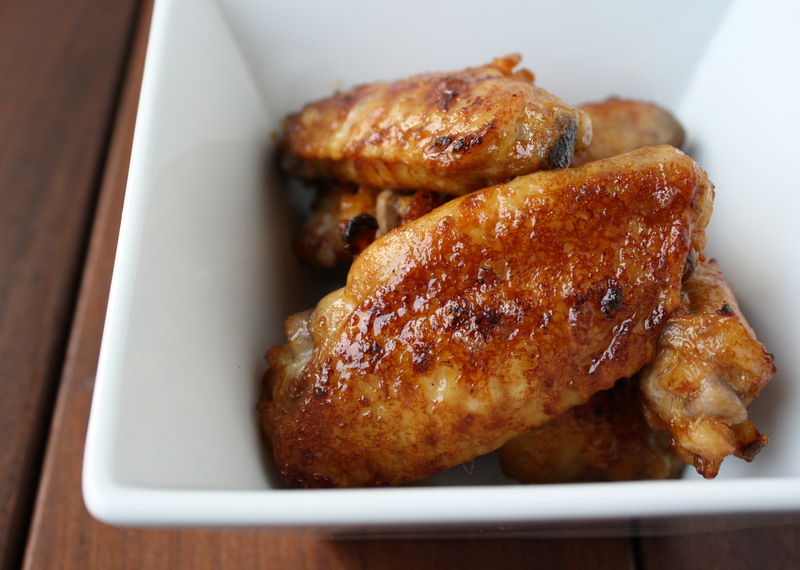 We’ve been making chicken wings in my family for years, but my relationship with them wasn’t always amicable. In Japan we would cook the wings in a skillet on the stove since we only had a very small oven (most Asian kitchens aren’t outfitted with large ovens; toaster ovens are usually used for baking at home instead). Just about everything in our kitchen was stainless steel and our cooking utensils were metal, which was great for cleaning. But when the pilot light in the stove shorted (and it did, ALL THE TIME), you got a free lesson in electrostatics. Question: What happens when you happen to touch the stove with metal tongs while your other hand is resting on the metal counter? Answer: The electrical currents have a play date in your body! To this day my body tenses in preparation for a jolt whenever I smell soy sauce and sugar caramelizing. But we left that house, and eventually Japan. Somewhere along the way we found ourselves in a bigger kitchen, and we transferred the wings from the skillet to the oven. 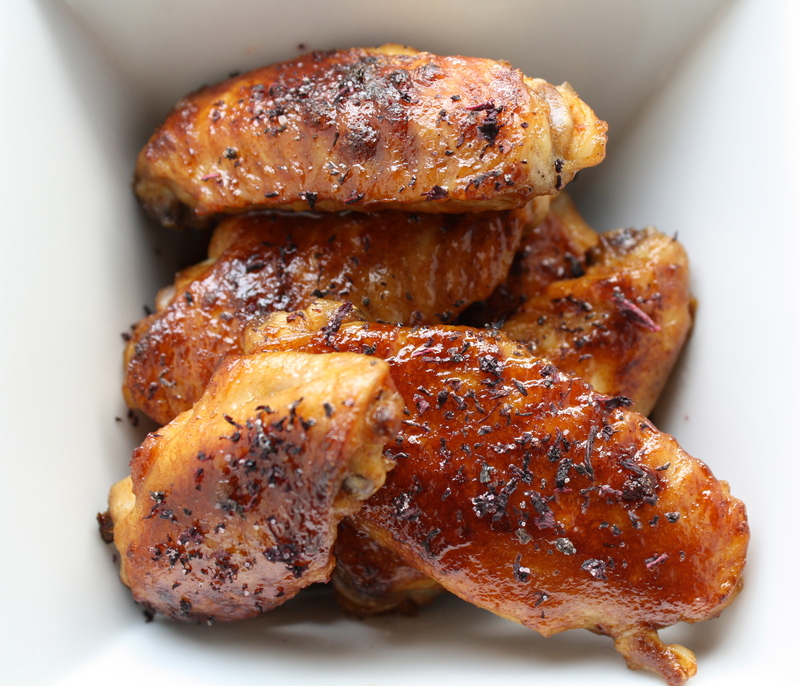 Nowadays I bake the wings first with just a little salt, pepper, lime juice and oil, (you could add other spices like Chinese five spice or chili powder) and then glaze the wings with the sauce right before I throw them under the broiler. With this method the meat is nicely seasoned and the sweet-salty sauce gets deliciously charred and sticky under the intense broiler heat. 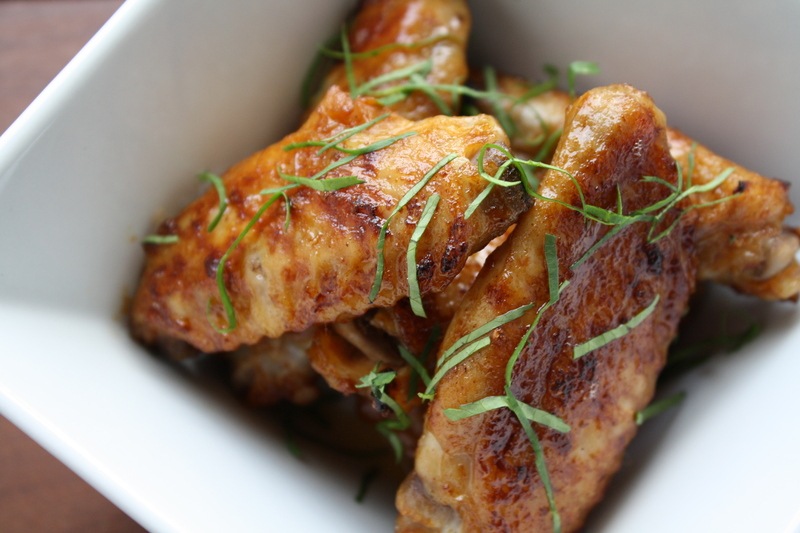 Hopefully your kitchen is in compliance with safety codes, so making these simple Asian wings won’t leave you permanently traumatized. While the wings are baking sweat the onions, garlic and ginger in a small saucepan over medium heat. Combine the soy sauce, water, ketchup, mustard, sugar and Sriracha together in a bowl. Mix well. Once the onions are translucent (about 5 minutes) add the liquid mixture to the saucepan. Simmer for 5 minutes. Remove from heat. Strain. Pour the strained liquid into a large bowl. Add the semi cooked chicken wings to the sauce and toss to coat. 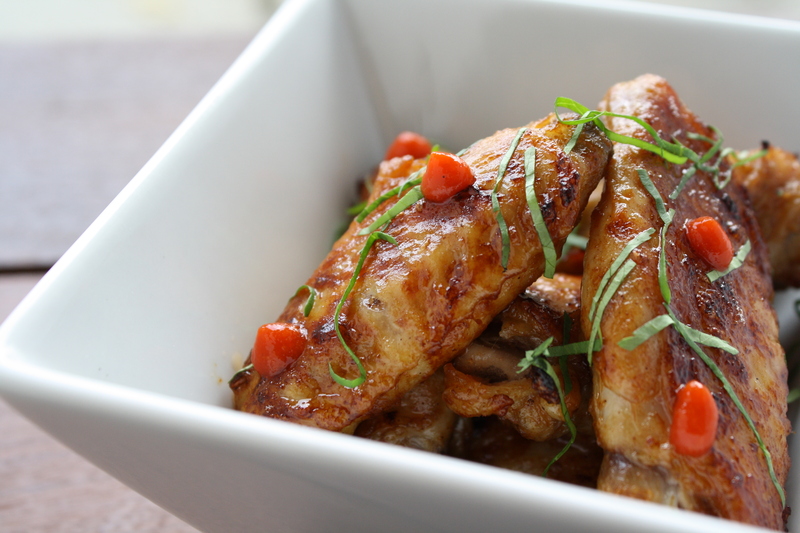 Return the chicken wings to the sheet pan and place them under the broiler (turned to high) for a couple of minutes. Remove and flip the wings. Return to the broiler and sear the other side of the wings (1-2 minutes). Remove when you have the color and caramelization you want. Can be served as is…. Or with a dusting of shiso furikake—shiso, the popular Japanese herb (also called beefsteak plant), flavored rice seasoning… salty, tart and slightly floral. I love your happy dance! Definitely try it with the furikake, it’s pretty damn good.